BRODYQUEST is either an indicator of epic win, the new Boo This Man!/Keyboard Cat, or the new RickRoll. Whatever the case, it first appeared as the viral video opening for NSFW #30 and has since become a part of the media arsenal for the show. When dismissing callers who fail, Brian orders Justin to "Brody 'em." During the studio prep for iPad Today #4, jammerb Brodied Tom Merritt and the TWiT livestream. 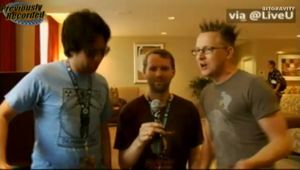 While at Dragon*Con, Brian and Justin attempted to sing the BRODYQUEST melody right before the daytime convention floor coverage, leaving Tom baffled at such shenanigans. During the final Shut Up and Play, Brian played AND sang BRODYQUEST in Rock Band. King Leo joined in at the end. Another variant appeared, this one featuring Leo Laporte but cuts off before the vocalized portion. Brian retweeted it, suggesting that TWiT actually consider using it during instances of tech fail. Leo himself played the video along with the original BRODYQUEST during the live version of The Tech Guy (9/5/2010, during hour 3); while Leo was puzzled by the mere existence of BRODYQUEST he was still amused by it and this "LeoQuest" version all the same. On 9/9/2010, Leo saved a copy onto the studio machines to use during extended tech fail, essentially (albeit indirectly) adopting BRODYQUEST as the anthem of TWiT fail. This page was last modified on 5 August 2014, at 18:56.